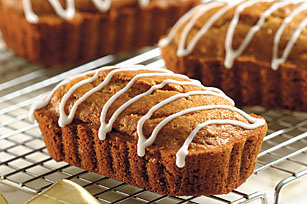 Add this Mini Gingerbread Loaves recipe to your list of holiday favorites. Not only are these Mini Gingerbread Loaves delicious, but fat-free milk and reduced fat sour cream help make these fun-sized gingerbread loaves a Healthy Living recipe. Combine first 7 ingredients in medium bowl. Add milk, sour cream, egg and honey; stir just until blended. Spoon into 3 greased and floured 5-1/2x3-1/4x2-inch disposable mini loaf pans. Bake 30 min. or until toothpick inserted in centers comes out clean. Cool completely. Add 2 tsp. water to sugar; stir until blended. Add remaining water if necessary until desired drizzling consistency. Drizzle glaze over loaves; let stand until firm. Process grahams in food processor or blender until finely crushed. Stir 1/2 cup raisins into batter before spooning into prepared pans. This gingerbread makes a great gift to bring to a holiday party. Cool completely, then wrap in plastic wrap before placing in a holiday-themed basket or container. Or wrap in decorative holiday wrap, then tie with colorful ribbon before giving away. Have a taste for something sweet but trying to eat right? A serving of this irresistible gingerbread is sure to hit the spot!